An osprey chick which survived a lightning storm that damaged a camera on a neighbouring nest has been nicknamed “Bolt”. 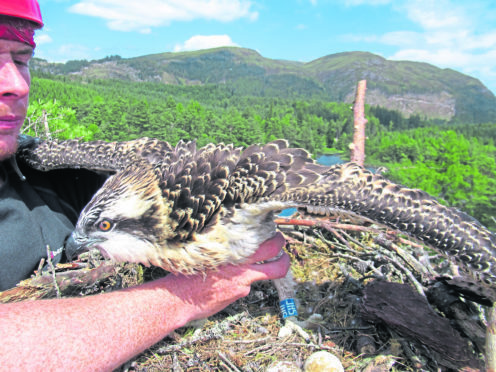 Woodland Trust Scotland operates the live camera feed from an osprey nest at Loch Arkaig in Lochaber. Conservationists were cheered this week however when it emerged that the next nearest osprey pair successfully reared a chick. The feisty youngster, in a nest one mile from the camera tree, has just been ringed by a licensed expert. “It was a great pity when the camera went dark in early June. We checked out every single possible fix on site but nothing worked, so we took the camera out of the tree and sent it away to be assessed. He added: “This diagnosis arrived at the same time as pictures of the osprey chick from the next nest so we nicknamed it ‘Bolt’. A slick coating was daubed onto the lower trunk to stop martens gaining any purchase, and low hanging branches were trimmed to stop the animals jumping on. When the tree was visited to investigate the camera fault, it emerged that some branches had partially broken off the tree and were dangling down to the ground. Osprey gender is usually estimated based on their size versus age. Females are bigger than males. As it is not known when Bolt hatched it is not known if it is a he or a she.